It’s exam period at UWF and I am studying my various courses : Marketing Strategy, Information Sources for Business Decisions, International Business and Current Social Problems. In the course material of the two last ones, I read content that made me want to watch that documentary I had heard about a couple of times now : Prison Valley. While we extensivelly discusses the crime issue in our Current Social Problems-class, the part of our International Business-class about privatization of public services as a way of achieving growth in global service industries (like prison management) pushed me to type http://prisonvalley.arte.tv/ into my browser. Here’s what it’s about… and what I think about it. In Cañon City, Colorado (36,000 inhabitants, 13 prisons), prisons are part of people’s daily lives. There’s even a sense of pride to being host-city of this industry : orange, the color of the inmates’ uniforms, is overrepresented on the streets. The Riviera Motel, in which David Dufresne and Philippe Brault, the two producers of the web-documentary, stayed during their journey, is all orange. One in six employees of Colorado’s Department of Corrections works in the small Fremont County, the county of Cañon City. But the importance of the prison industry is not a local, nor a statewide specificity : it is a national issue. While in Germany there are 93 prisoners per 100,000 country residents and in France they are 103 per 100,000 people, in the United States they are 750 ! This is more than 1 in 100 adults… I see this as a social problem, and some of Canon City’s inhabitants share the same opinion, including the sheriff. However, this stream of prisoners brings jobs to this small city too, and they’re recession-proof jobs too. But, with 13 prisons in a single county, there must be more than just philantropy towards the locals. In the county, public prisons are mixed to private, or for-profit prisons. Not that the State of Colorado stopped building prisons… in fact, there’s one new facility currently being finalized and supposed to open in August 2010 : Colorado State Penitentiary II. Lobbyists working for private companies have convinced the State the following deal : the private sector finances the construction of the facility, and the State provides a constant flow of inmates to be held in jail. Sounds crazy, but that’s basically how the system works. Of course, the longer the prisonners’ stay, the more money goes to the (private) prison-facility. And the documentary points out another side of the system : inmate labor. 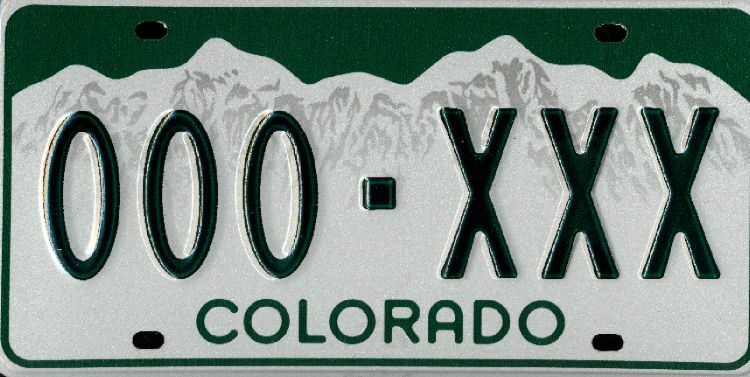 For example, all of Colorado’s license plates are manufactured in the State’s prisons. It’s one of the best paid jobs for inmates, they make 50$ a month stamping them. Some of the new state prison’s cells are also welded and assembled by inmates of the Fremont Correctional Facility, and that’s how the circle closes : prison inmates (employed by Unicor, which is the trade name of the Federal Prison Industries) provide cheap labor to build for-profit prisons ; in other words, the customer becomes the supplier, who provides labor at unbeatable prices. In Europe, prisoners work too, but outsourcing the whole prison management seems unthinkable to us Europeans. We might not have the best system either. In France, for instance, prisons are so overcrwded that the European Committee for the Prevention of Torture calls in “inhuman and degrading treatment“. The web-documentary utilizes the potential of the web2.0 to educate us about the social problem of crime and, more specifically, emprisonment. 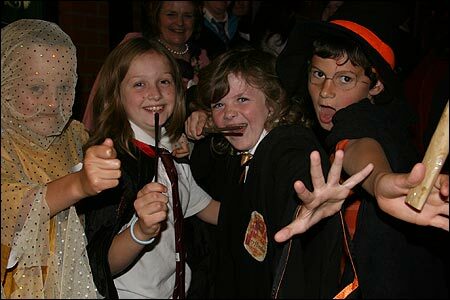 You don’t have to visit every discussion forum that is proposed to you between the different parts of the movie, nor do you have to read one of the explanatory websites that give deeper insight into the movie’s subject. But it is definitelly worthwhile watching… just don’t grab a bowl of popcorn, because this web-documentary is designed to be (very) interactive. The issue of the Stanford Social Innovation Review was on a corner of my desk for a while, but I finally managed to find the time to read this article which makes the cover-story of Stanford’s journal : Design Thinking for Social Innovation, by Tim Brown and Jocelyn Wyatt. Both are executives at IDEO, a global Design design firm which has worked with notorious companies like Kaiser Permanente or Shimano (see this previous blog post). In this article, the authors highlight the social scope of Design Thinking, explaining in what way it can help very poor people to improve their lives. There’s maybe no other domain in which human-centered design is as important as in social issues. As the article says, “social challenges require systemic solutions“, because these problems are wicked, and demand to adress peoples’ real needs, in the most effective possible way. Look at d.light, created by two students of Stanford’s Institute of Design : what started as a way to provide affordable and safe light for people without access to electricity has now become a global company with an efficient distribution, sales & marketing strategy. And they want to “have improved the quality of life of 100 million people” by 2020. 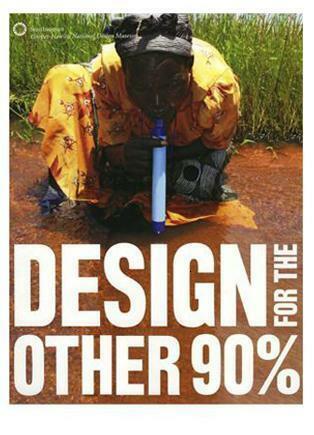 But in what is Design Thinking responsible for improving poor peoples’ lives ? The innovation approach has already been embraced by successful companies like Procter & Gamble or RIM (Blackberry), as one of the theory’s fathers Roger L. Martin describes in his book The Design of Business. Nonprofit organizations are discovering Design Thinking as a way to find “high-impact solutions [that] bubble up from below rather than being imposed from the top“. An interesting example is provided by the authors when they depict Jerry and Monique Sternin‘s approach to decrease malnutrition in Vietnam in the 90’s. They found so-called “positive deviants“, people whose behaviors revealed a viable solution to overcome nutritional flaws : they added tiny shrimps, crabs and snails from rice paddies to the food, and they fed the children multiple smaller meals. By offering cooking courses to families, 80% of the 1,000 enrolled children became adequately nourished. Design Thinking is about finding creative ideas, including those of deviants who may have viable solutions to problems too. The approach relies on thinkers being “T-shaped“, an expression introduced by Berkeley-professor Morten T. Hansen (the article was already published in Harvard Business School’s Working Knowledge in 2001). This means that beside having a deep knowledge of a specific field, the design thinkers has a broad understanding of other disciplines, as well as being open, curious, optimistic and practice-oriented. This last point is important because the implementation-part of the problem-solving system requires prototyping and trial-and-error experimentation to get to a solution. When VisionSpring asked IDEO designers to help them to design a low-cost eye-screening process for children in India, it took them long to discover that the children were intimidated by the pressure of the experience. The system was designed accordingly and VisionSpring since conducts numerous screenings with children and adults. “VisionSpring’s design efforts included everything other than the design of the glasses”, say Brown & Wyatt, thus focusing on marketing and implimenting their program. Check out the Wikipedia article if you want to find out more… or read Tim Brown’s Change by Design. 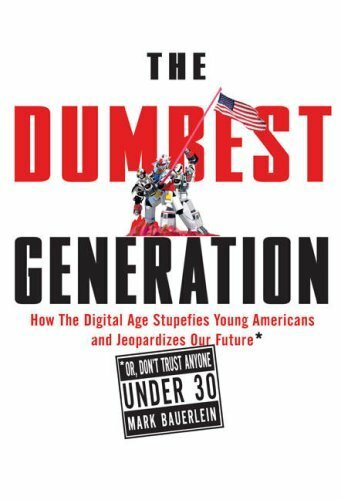 As I walked around in the UWF Bookstore a couple of days ago, I fell on this book with the provocative title “The Dumbest Generation, How the Digital Age Stupefies Young Americans and Jeopardizes Our Future (or, don’t trust anyone under 30)“. Labelled national bestseller and praised by renown newspapers all over the front & back covers, I wanted to find out more. Not only that I’m curious and that I want to discover what American academics think about my peers, but also because that stuff certainly applies to us Europeans ! By the way, the title “The Dumbest Generation” comes from Philip Roth’s novel The Human Stain, published in 2000. 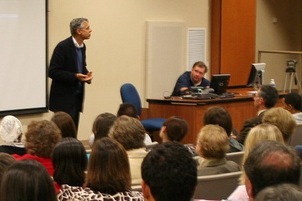 The author is Mark Bauerlein, English professor at Emory University in Atlanta, Georgia, where he lives with his family. He was appointed director of Research & Analysis at the National Endowment for the Arts (NEA) in 2004, which is a cultural federal agency promoting fine arts and litterature among Americans. He also writes for various newspapers like the Wall Street Journal, The Washington Post, The Chronicle of Higher Education and other periodicals like The Yale Review or the Publications of the Modern Language Association (PMLA). He seems to be highly engaged in education and litterature research as I figured out while reading his book (see here, here or there). The message that Bauerlein wants to deliver is the following : how come that the youth has so little knowledge while surrounded by so much information ? Based on a lot of survey & study results like Reading at Risk (which he oversaw while at the NEA), the statement basically says that young Americans “don’t know any more history or civics, economics or science, litterature or current events“. According to the book, Generation Y spends stunning $172 billion a year while saving only $39 billion… “marketers had better be ready for it“, it says – regretting that material possessions matter more than intellectual possessions. American universities still have the world’s best engineering programs, he says, but more than half of all the doctorates come from abroad, and it’s no secret that in a couple of decades knowledge will shift to the Asian continent. The XIXth century was European and the XXth century was American, the XXIst will be the Asian century. The knowledge deficits cover various disciplines like history, civics, science and fine arts according to Bauerlein. The 2006 National Survey of Student Engagement reported that 27% of first-year college students “never” attended an art exhibit, gallery, play, dance or other theater performance. Generation Y is the first one to ever trumpet what Mark Bauerlein calls a-literacy : knowing how to read, but choosing not to ! It is proven that regular readers score better at knowledge tests and learn at a faster pace than those who don’t – it’s also called the “Matthew Effect” – and young Americans seem to disregard reading today. The question is : does this generation have other, maybe more valuable skills, like some kind of digital literacy or “E-literacy” ? 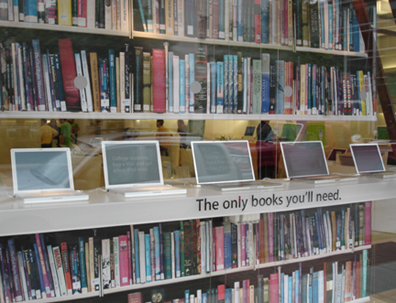 Is Apple‘s “decisive lifestyle choice” awkward or even damageable for uorselves ? They designed a whole new way of approaching information by making it more visual and pleasurable, and I think that’s not were the problem lies. As Bauerlein implies, the problem is the freedom of choice that we all have (and claim!). Hence, our web-based environment has become “a consumer habitat, not an educational one“, where peer-pressure and peer-judgement matters more than “vertical modeling” such as relations with teachers, parents, employers which is so crucial to gain maturity. The youth downplays tradition, history and experience in favor of short-sightened social interactions, which leads a kind of Peter Principle (“by proceeding in school and social circles without receiving correctives requisite to adult duties and citizenship. They reach a level of incompetence, hit a wall in college or the workplace, and never understand what happened“). Mark Bauerlein concludes his book by refering to the youth movements of the 60’s and 70’s who “denounced the legacy of their elders […] but at least they knew them well“, which he calls informed rejection of the past. Today, we are facing an “uninformed rejection of the past, and then complete and unworried ignorance of it“. Not that he wants a generation of elite intellectuals, but he highlights the importance of lesser intellectuals whose general knowledge is so important to educate the coming generations – what kind of parents will we be in 20 years ? “If social life has no intellectual content, traditions wither and die“. A very pleasant book which highlights a worrying evolution of a part of the youth. Sometimes a bit loaded in survey results but well-written and interesting. I definitely recommend it. If you want to find out more, visit dumbestgeneration.com . L’enthousiasme planétaire né suite à l’élection de Barack Obama montre « que nous partageons non seulement des valeurs communes mais aussi des valeurs d’émancipation ». Un des participants à l’entretien, Stéphane Paoli, cite trois évènements fondateurs de notre siècle : le 11 septembre, la crise économique et l’élection de Barack Obama. Ce dernier, « qui représente la moitié de l’humanité par ses mélanges », a la difficile tâche d’ouvrir un pays au reste du monde, si diversifié. Le mythe du melting-pot ne mènerait donc pas à une ouverture d’esprit, mais au fait que les américains « confondent leur histoire et celle du monde et pensent ainsi être de plain-pied avec les autres cultures ». Ainsi, Dominique Wolton fustige une certaine arrogance dans la manière d’agir des américains : « Partir en guerre contre des hommes qui ont 5 000 ans d’histoire dans leur mémoire collective, alors que l’on a soi-même que 3 siècles d’histoire, risque de provoquer quelques télescopages… ». En effet. L’émergence d’internet permet à chacun d’être au courant de tout, tout de suite. Cependant, il est intéressant de lire que « nous sommes devenus des géants en matière d’information mais de nains en matière d’action ». Je ne suis pas tout à fait d’accord puisque Time Magazine, en plaçant … , affirme que l’individu devient de plus en plus puissant, notamment grâce àinternet. Il suffit de voir ce qu’ont permis des médias tels que YouTube, Twitter ou Facebook dans la crise iranienne pour voir que l’individu peut devenir très puissant. Ce n’est pas pour rien que la Chine bloque ces médias sociaux assez régulièrement. Une multitude d’autres thèmes sont abordés par les trois participants à l’entretien (Dominique Wolton, Stéphane Paoli et Jean Viard) et le fil rouge est l’importance de la communication dans la cohabitation des peuples, qui sont aujourd’hui plus que jamais confrontés les uns aux autres. A lire absolument ! La mode écolo envahit-elle les terrains de sport ? Alors que la responsabilité sociale des entreprises(RSE) et de plus en plus mise en avant, les deux géants de l’industrie des loisirs se mettent à lancer des produits écologiques. Alors que certaines marques ont depuis longtemps adopté cette démarche à leur manière (Patagonia emploie des matériaux recyclés, Quicksilver oeuvre pour la sauvegarde du littoral…), les grand noms du sport ne s’aventuraient pas trop sur ce terrain. Zoom sur les deux lignes “éthiques” des deux plus grandes marques de la planète. Ca y est, on a le droit au match des équipementiers sur un terrain bio… Peut-être par peur de jeter le discrédit sur leurs autres produits, Nike et Adidas n’ont jamais voulu se lancer dans les produits vendus comme étiquement corrects. Il faut dire qu’après les scandales des années 90 ils se sont précipité à signer des codes de bonne conduite, à entamer des collaborations avec des ONG et à promettre d’avantage de transparence aux institutions internationales. Chez Nike, l’impulsion est venue du basketteur américain Steve Nash quia fait pression sur son équipementier en promettant de porter des chaussures “recyclées” jusqu’à la fin de sa carrière si Nike lui en développait. Conscient de la qualité de l’offre que leur faisait le joueur de Pheonix, Nike a développé la Trash Talk, déclinée dans plusieurs coloris, dont la particularité est d’être faite de matériaux recyclés. Est-ce vraiment nouveau ? Pas vraiment puisque Nike utilisait déjà des matières recyclées (Nike Grind) et que son programme social Considered (qui vise à développer et à produire de manière plus écologique) existe depuis 2005. Ce qui est nouveau, c’est que Nike s’est engagé à produire toutes ses chaussures en mode “Considered” d’ici 2011. C’est un bon début. De l’autre côté de l’atlantique, à Herzogenaurach, Adidas s’est aussi mis à réfléchir. Le nouveau label de la marque à trois bandes s’appelle SLVR(“silver”) et ne sera distribué que dans un réseau spécialement dédié à cela. Les produits milieu de gamme se veulent sobres, abordables mais aussi écologiques puisqu’ils sont conçus et fabriqués de manière très simple, et ce afin d’utiliser moins de colle, nocive pour l’environnement… Bon. Ceci dit, il faut un début à tout et le greenwashing est sans doute la dernière à chose à faire pour ces marques loin d’être irréprochables. Autre solution proposée par Adidas (pardon, par SLVR) : le Zero-Waste-Tee qui n’est autre qu’un t-shirt fait à partir d’une seule pièce de coton bio. C’est à l’occasion de la promotion de la version française de son livre Natural Capitalism qu’Amory Lovins est de passage à Paris. Il fait partie des “80 hommes pour changer le monde” présentés par Sylvain Darnil (ESSCA) et Mathieu Le Roux (HEC) dans leur livre paru en 2005, présentant des “Entrepreneurs pour la planète” dont Muhammad Yunus est un des plus connus. Encore un essayiste qui nous pompe l’air avec des théories de décroissance et des leçons de morale bien-pensée? Et bien non ! Explications. Tout d’abord, Amory Lovins n’est pas un “essayiste”. Le créateur et dirigeant du think-tank américain Rocky Mountain Institue est aussi physicien, inventeur, designer automobile, et surtout consultant. Il conseille en effet de grosses entreprises (Ford, Dow Chemicals, Boeing etc.) et de nombreux chefs d’Etat dont Barack Obama en éfficacité énergétique. Le magazine Time l’a récemment classé parmi les 100 personnalités de l’année à cause de son rôle de pionnier dans la lutte contre la dépendance énergétique mondiale, et bien entendu pour son influence économique et politique toujours croissante. Ensuite, l’auteur d’une trentaine de livres ne se borne pas à énoncer les vertus supposées d’une décroissance nécéssaire. En effet, son “acuponcture institutionnelle” se base sur le fait que les profits sont très étroitement liés aux économies d’énergie: “il faut échanger les mégawatts par des négawatts“. Peut-être a-t-il enfin trouvé une langue que les grands patrons américains comprennent, toujours est-il qu’ils l’écoutent. Ainsi, Wal-Mart a réduit la consommation de ses camions d’un quart, Dow totalise a économisé 9 milliards de dollars grâce à des investissement judicieux à hauteur d’un milliard de dollars il y a quelques années, Dupont a diminué ses émissions de CO2 de 80% par rapport à 1990 ! Ce sont ces “gisements de néga-watts” qui sont, selon lui, à l’origine de la croissance économique de l’avenir. Car selon M. Lovins, la croissance économique n’est pas limitée : “croissance infinie de richesses matérielles, non. Mais une croissance infinie d’accomplissements humains, oui” confie-t-il à la journaliste Laure Noualhat dans l’interview qu’il lui a accordé il y a quelques jours [cdurable.info]. Il affirme que les Etats-Unis pourraient être auto-suffisants en énergie à l’horizon 2040… sans devoir abandonner l’American Way Of Life ! Puis, en faisant référence aux grandes religions, il précise bien la croissance économique n’est pas une fin en soi, mais qu’il doit bien servir “pour servir les hommes eux-mêmes”. Bien qu’il soit en phase avec Nicolas Sarkozy, puisqu’il prône une réflexion sur la pertinence de nos indicateurs actuels, il fustige le modèle énergétique français dans son ensemble. Pour lui, l’avenir appartient aux “petites centrales électriques” et induit donc une décentralisation de la production d’énergie (alors que le France investit dans des centrales nucléaires de plus en plus grosses). Encore une fois, ce ne sont pas des paroles en l’air. Dans sa maison du Colorado où les hivers sont rudes et longs, il fait pousser des bananes et des plantes tropicales grâce à une utilisation optimale des ressources naturelles (soleil, eau etc.). Sa facture énergétique ne dépasse pas 5 $ par mois, et l’été il vend son surplus d’électricité ! The Catalan club had an informal agreement with the Basque club Atletico Bilbao that stated that, like the national teams, the clubs had to represent their regions (the Basque Country and Catalonia), and therefore not to have any sponsor. When the two clubs finally decided to resort to sponsoring, they swore to choose an “ethically compatible partner”, and whilst Atletico started playing proudly with a large EUSKADI (Basque government funding) on their chest in 2004, Barcelona still hadn’t reached any agreement. The club wanted to go even further, and that’s why it chose to partner up with the UNICEF. Instead of receiving money, the club was commited to pay EUR 1.500.000 in five year to the United Nation’s body for childhood, as well as 0,7% of the revenues of its private foundation… like any European country which has to pay 0,7% of its GDP to the United Nation’s campaign for child education. This is how the FC Barcelona symbolises ethical acting in a world where too few clubs follow in the footsteps of the Barça. I spontaneously think about the “Ein Herz für Kinder“-logo which we could see on the first half of the season on the shirts of the new German champion VFL Wolfsburg [blog]. In this PR-action, it was the main sponsor Volkswagen who gave up its “shirt-space” to the charity organisation who works for children for 30 years now. Another campaign crossing my mind was the blue “Schools for Africa” stripe on Team T-Mobile’s cycling jerseys, and of course the very popular “Livestrong” campaign of Lance Armstrong who currently races in Italy for his -still- team Astana.